I love how the grosgrain gives the touch of texture. Great take on the Muse! I could have sworn (didn't) that those strips were actual ribbon. WOW!!! Great take on the Muse! I love your take on the Muse! The colors are so striking and the grossgrain adds so much great texture...love the dash of sparkle on the birds, too! This is a fun and happy card! Love the way you were inspired! Beautiful, vibrant, fun! I'm sure that your use of that fabulous grossgrain die have shot the sales of same through the roof!!! Wow, I couldn't believe that wasn't actual grosgrain! I love those sweet glittery birdies - what a find! What a fantabulous card Ardyth, where do I start, those fun glittery birds or the gosgrain 'die' ribbon.... oooooh my want list just got longer I just adore everything about it! Gotta love that grosgrain!! And the little birdies. I really, really, really need to get that texture plate! So fantastic. Wow--they do look like strips of grograin ribbon--gotta check that out! 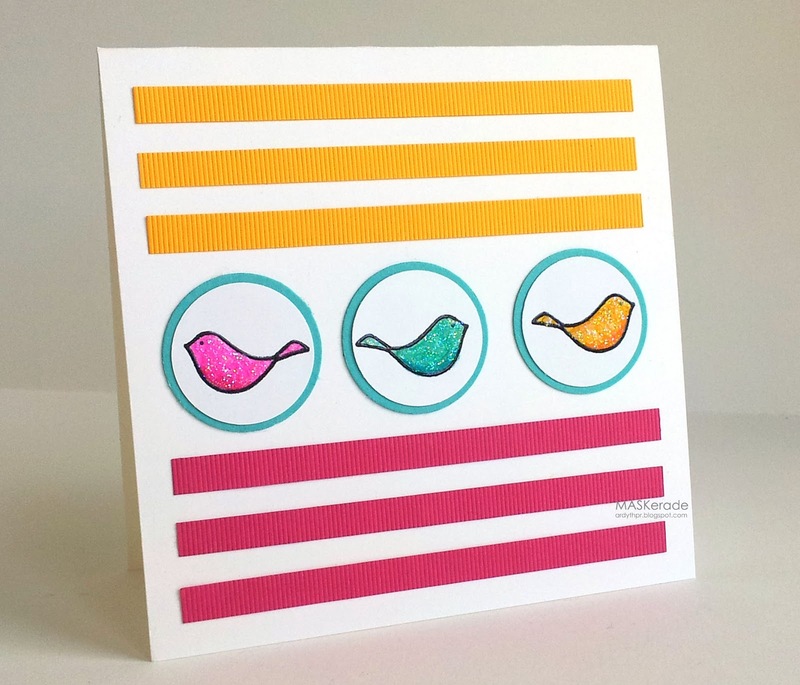 LOVE the glittered birdies--totally cute card! this is fab, I totally thought it was ribbon! You're an expert at this... brilliant take onTherese card!! I really thought that was grosgrain ribbon...wow!! Your card is fantastic, Ardy! I'm so torn over that die. I've had it on my wish list since the first time you used it, but then I remember how much grosgrain actual ribbon I have and I hesitate. Aacckk! If nothing else, your use of that die provides wonderful inspiration for ways I can use up my ribbon, so thank you!! Lovely! I do like the texture on the ribbon and the sparkle on the birds! Ooh do like this, the colours, birds, glittery shimmer & the grosgrain ! Wow, this is one amazing card! I love those birds and your bright colors, so fun and festive. I also thought the grosgrain was actual ribbon - it looks so real! Your card is striking in its simplicity, Ardyth. The shine on the birds also add that little touch of OOMPH! Nice! I love those birds Ardyth and that ribbon die is awesome - it looks like real grosgrain! Gorgeous bright colours - love the birds! Oh gosh, Ardyth. I thought that was grosgrain ribbon! I thought there is no way I could cut ribbon so neatly...but maybe MFT can remedy that- and I am only 45 minutes from the store this week...hmmmm. It's always a pleasure to see how you translate each element to your own card! Totally fooled on the grosgrain again. The accountant in me is always to happy to see everything precisely laid out ... your spacing is impeccable! Such a bright, sweet card. Very cute.